Last year as part of a school site technology committee I visited multiple classrooms throughout the district who were using a variety of digital devices. The group happened to visit one 6th grade classroom where students had access to Macbooks, an interactive whiteboard, a classroom response system, and iPod Touches. As we walked in the students and teacher were engaged in a math lesson. In many ways it was a fairly traditional lesson. The teacher provided direct-instruction via the interactive whiteboard while students took notes, discussed problems in pairs and whole group, and responded to questions via the classroom response system. However, the most eye-opening moment occurred during the independent practice portion of the lesson. As students worked through the assigned problems, many of them pulled out iPod Touches, plugged in headphones, and launched the video app. As I walked around the room I realized many students were watching their math lesson all over again. I leaned down next to a 6th grader. As I talked to more of the students I found similar patterns in their answers. The two 6th grade teachers at this school had used screen casting software to record the key parts of their math lessons and placed these videos on the class-set of iPod Touches. This simple trick allowed students to be self-directed in their reteaching and provided the teacher an opportunity to provide small group instruction while the remainder of the class could continue with their work. In my previous post I talked about the need for technology purchases to be guided by the instructional goals of school site. However, sometimes I think we aren’t even sure what the technology is capable of helping us do. Before walking into this classroom I was a little skeptical about the usefulness of an iPod Touch. Often I had heard of sites trying to use them as many laptops, complete with wireless keyboards four-times their size but with very mediocre outcomes. However, when I walked out of this class I realized mobile devices can have powerful place in our classrooms if we leverage them in the right way. Chances are at some point in the last 24 hours you saw at least one advertisement for an iPod Touch, iPhone, iPad, or their Android equivalents. More than likely you have one of these sitting in your own pocket and a have observed a few seriptciously (or openly if you’re at at more forward-thinking school) floating around your classroom. Like many of your students I find that both my iPhone and iPad are becoming tools I would hate to live without. My iPad contains a complete collection of books I’m currently reading, video podcasts to improve my German language skills, and access to a variety of online reading materials including the New York Times, Flipboard, and my local newspaper. Each morning, when I wake up my iPhone is the first thing I usually grab. It’s my alarm clock, my calculator, my translator and even a level. It’s also how I primarily access social networks like Facebook which I (like many people) use as a tool for sharing ideas and filtering out all of the online noise to find articles, videos, photos, and blog posts worth reading. Similar to the 6th grade class, both my iPad and iPhone are personal learning devices. They are completely customized to serve the needs of my self-directed learning. Think about that for a second… These are my personal learning devices. With inexpensive and ubiquitous resources, I have differentiated and personalized my own learning experience. Could we provide the same experience for our students? When I was in the classroom I was successful at many things, but I will admit that one of my biggest challenges was properly differentiating instruction for my students. I have a feeling I am not alone. What do we expect when teachers are assigned a new group of 34 students appears every 50 minutes? Even with the best of intentions teachers often end up shooting for the middle. While “the middle” might serve the needs of many, there are also groups of kids who are completely lost and an equally large group desperate for a challenge. With the right collection of apps, videos, digital texts, and audio content I believe teachers have the ability to personalize and differentiate learning with mobile technology. We’re already seeing elements of this with projects like the flipped classroom. However, I think we have only begun to really investigate this possibility in education. We’re still purchasing personal mobile technology like iPads and iPod Touches with a laptop cart mentality. We have this idea that the device should contain a standard set of resources for all students to share, stay with the teacher rather than follow the student from class to class, and never go home in their backpacks. While I understand costs often dictate these decisions, I also think they put us in a place of selecting tools and then using them for completely inappropriate purposes. iPod Touches and iPads are not inexpensive laptops. The sites that are purchasing these devices with that mindset are always disappointed. If you feel that every student at your school needs a laptop sitting on their desk, then please buy them a laptop. However, take a moment and really think about that assumption. Do your students need a laptop every moment of every day? Are they in constant need of a full-size keyboard and the ability to create extensive pieces of text and multimedia? Or could your students benefit from a mobile personal learning device with timely access to multimedia-capable computers that are shared between teachers? With a personal learning device students can re-watch lessons, conduct research, read digital text, respond to questions, post to blogs, email, participate in discussion forums, and edit educational social network profiles. They also have access to calculators, stopwatches, maps, and dictionaries. However, I also think its important to call out one assumption I am making – as personal learning devices they are just that…personal. Every student needs one and to be most effective that device needs to travel with the student from class to class, to home, and back to school. The student and teacher also needs the ability to individualize that device to the student’s instructional needs. And perhaps that is the real question. Are we willing to make the investment to support our instructional goals with an appropriate level of technology hardware, software, and professional development? 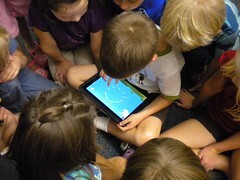 iPads & iPods in Canby School District – Their videos are worth watching. If you have other models you think are effective please post them in the form of a comment below. The more all of us understand how are colleagues are leveraging these tools for effective teaching and learning, the better we will be able to help students and teachers. In my next post I’ll take a look at why you might consider Chromebooks for your classroom.